When you want less, you consume less—and you also need less. First of all, I should mention that The Year of Less is not a self-help book nor a manual to achieve minimalist living. The Year of Less is a memoir about the challenges of bettering ourselves, and the unexpected consequences of our success. The book matches the first year of Cait’s “shopping ban”, however the author also looks back on previous experiences: from going 100% alcohol-free to losing significant weight, to paying back a 30K credit-card debt within 2 years. For the first few chapters, I was quite disappointed in The Year of Less. I picked it up after reading a review that made me think it was about the author’s experience of frugal living… which it is, partially, but minimalism is by no mean the main substance of the book. The memoir starts with much reminiscing about partying and excessive drinking as a young adult, which I wasn’t interested in. Yet, Flanders has an enticing writing style which kept me reading and finally, I got into the book. 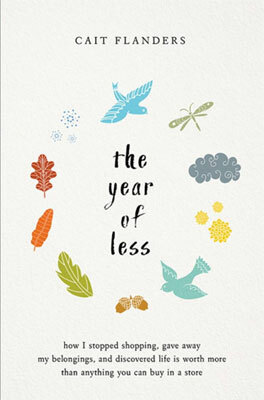 The Year of Less is a very introspective and—at times—insightful book. It’s about how one gets there: drinking too much, eating poorly, mindlessly purchasing items one doesn’t need, or overworking. Surprisingly, for Cait—and probably for many of us—all those behaviours had a few common causes: the need to feel comfortable about oneself and the difficulty to fulfill it. For the author, each challenge—repaying her debt, loosing weight, giving up alcohol, the shopping ban—has been like peeling off layers from her cocoon, to expose feelings that those behaviours were trying to numb. The toughest part of not being allowed to buy anything new wasn’t that I couldn’t buy anything new—it was having to physically confront my triggers and change my reaction to them. It feels like her shopping ban was especially insightful, maybe because the author naturally embraced minimalism at the same time: not only did she challenge herself to solely buy necessities for a year, but she also decided to declutter her home. She kept coming back at it, progressively donating, selling, or throwing away more “stuff” as her confidence grew that she was happier with less. In the process, she exposed what was actually very important to her: friendship, travelling, and writing. The process of decluttering her home led to also declutter her mind and pinpoint what made her content in life. The best gift the ban had given me was the tools to take control of my life and get a fresh start as my real self. It challenged me. It turned my life upside down. It helped me save $17,000 in a single year. And then it saved me. Even though the book is more a personal journey than a book about frugal living, it does provide a few interesting tips (as well as a final chapter called “Guide to Less”). Some are unsurprising advice such as making a rough budget sheet or open a saving account in which you would transfer monthly the money you were previously spending on superfluous things. Other are more eye-opening, and interestingly could apply to whatever life-choices you might make: for instance, how to deal with peer pressure; how important it is to find friends who share your new commitment; and how you must be gentle with yourself if you slip, lest you entirely give up the challenge. I didn’t think that anyone would care that I quit shopping, but I also never got mad at my friends when they started making comments that expressed otherwise, because I knew the truth, which was that I had left them too. I had broken the rules and rituals that had bound our friendship in the shopping world. We would no longer be able to find pleasure in buying things at the same time or talking about the deals we got or sharing tips on how to save. So, while I was initially disappointed that The Year of Less wasn’t more focused on how to achieve frugal living successfully, I still found the read insightful and enjoyable. I found Cait Flanders to be a very inspiring person, who managed to tackle some very tough challenges, learn from them and share the wisdom. This is probably an excellent book to read if you keep reading how-tos and books about minimalist or frugal living and despite being 100% convinced, find yourself discouraged as you see yourself giving up.